The Quantitative Social Science Scholars Program (QSSS) is a unique opportunity in undergraduate education at Carnegie Mellon. In recent years, increasingly powerful computational models of human behavior and the growth of data sets recording economic and social activity have created exciting new possibilities for entrepreneurs, policymakers and scholars seeking insight into human social behavior. Firms throughout the economy can now use data analytics to identify new markets, avoid errors and improve efficiency. Policymakers can use the same techniques to shape the direction and expand the impact of social policies designed to promote the public good. Social scientists can also use these techniques to create a deeper scientific understanding of human behavior. QSSS is designed to help outstanding undergraduates acquire advanced quantitative technical skills they can use to impact society as entrepreneurs, policymakers, or social scientists. 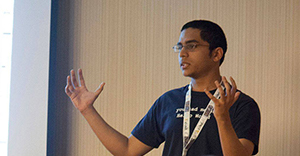 Crediting Dietrich College’s QSSS Program for allowing him to pursue his passions, Manojit “Jit” Nandi (DC’14) reflects on his time at CMU and shares his excitement for his new career move.